It is effective for imputing records from start to finish and organizes where charges are put in. It is also a program that frequently sends out updates and is constantly improving. The most impressive this about this program is you can tailor it to each clinic. Their support team is very helpful and efficient when we have questions. It takes a very long time to put in a change request to see things start to change. Some changes seem a little arbitrary and pointless. The program is based in New Zealand so the time difference can prove to be an issue on Friday afternoons but otherwise you can get a hold of someone in a timely manner. Be ready for a learning curve. It is not a difficult program and support is absolutely wonderful but make sure your team is on board and be prepared for some frustration. EzyVet helps us organize charges when seeing a patient thus preventing us from missing as many charges. They allow group charging for basic surgeries which is very effective but still allows for adjustments as needed. "We just started - it's an adjustment!" So our entire company switched from Avimark to ezyVet recently - and it's been a huge transition for everybody. One of the major benefits is that ezyVet is a cloud based software so we don't need to install it on all the computers. It's also really easy to use, user friendly for the most part, colorful and much more modern than our old software. It's definitely more customizable and the customer support has been amazing so far. One of the biggest challenges was transferring everything to ezyVet properly from Avimark. There were some kinks that we need to sort out. There's also some trouble for me personally in pulling marketing reports - I'm going to have to develop a new system to use it the way I need it. Great for the veterinary field! ezyVet is a wonderful new software that helps us keep track and manage our clients, as well as putting in the medical records and keeping tabs on everything. It's helping us consolidate and be more organized, as well as going PAPERLESS - which is a huge bonus for us! This item is cloud based, making it open from any PC or gadget with web, WiFi, or information plan abilities. We have had occurrences where we have lost web, yet I had the capacity to access and utilize the program easily by means of my iphone. I make the most of Ezyvet's instant message correspondence ability. Any content correspondence is consequently entered in a customer's correspondence log. Email is a similar way. Ezyvet sends somebody to prepare and help your staff the primary week that you execute Ezyvet. This was VERY useful and fundamental to our prosperity with Ezyvet. Likewise, Ezyvet's specialized help is speedy in tending to any issue that you may have, regardless of whether there isn't a quick fix to the issue. In spite of the fact that this product appears to be extremely confounded upon first look, when prepared, this product is moderately simple to utilize, and it addresses the issues of a bustling practice. it's a great program, Honestly, I can't think of much I don't like about ezyVet. We attempted one other cloud-based program before this one. It didn't satisfy its guarantees and was an immense misuse within recent memory. In spite of the fact that there is significantly more to learn with Ezyvet , it has been an extraordinary resource for our center. - Vets can return home as opposed to staying hours after to complete desk work - they can without much of a stretch completion at home through the cloud based framework and keep awake to date with their patient, official correspondence with the reminder work, and the capacity to do deals formats to effortlessly aggregate item codes and be increasingly proficient. "Great program for us so far!" The cloud aspect is great. When we did our conversion, they sent a trainer to be at our facility every day for a week. The overall functionality is very useful and works well for a fast-paced, high functioning clinic. The conversion from our previous system did not go as smooth as planned. Vaccine reminders did not all come over, and there has been a lot of inventory work we have had to do to correct things. But I think conversion issues are normal with any software change. Everything has been manageable and correctable. We tried one other cloud-based program before this one. It did not live up to its promises and was a huge waste of our time. Although there is a lot more to learn with Ezyvet , it has been a great asset for our clinic. Our last system was not cloud-based. Being able to login from anywhere has been a huge help. "Is it a beautiful software?" The ability to integrate with Smart Flow - for me in a practice that has this EMR the ability to have invoices automatically update directly from the patients treatment sheet and capture all the charges is one that I find as a previous manger make me wish we had Ezyvet. Their forms are not easily used to stay paper-free. Because it is a web based system it does not function as cleanly on a tablet to allow clients to fill in forms or easily sign. It is imperative that the whole staff participate and finish the training process. This will lead to less shock of change when getting started and remember GREEN is the good place to be! -Vets can go home instead of staying hours after to finish paperwork - they can easily finish at home through the cloud based system and stay up to date with their patient, inter office communication with the memo function, and the ability to do sales templates to easily group product codes and be more efficient. Communication between departments and facilitating client call backs is simple and easy to assign by department or specific employee. The software is not designed for use in an emergency clinic/24 hour setting. Quickly checking in emergency arrivals is difficult, and invoicing is very confusing for patients who are admitted for multiple days - there can be 5 or 6 separate invoices for a single stay in hospital. This is often very confusing for clients. 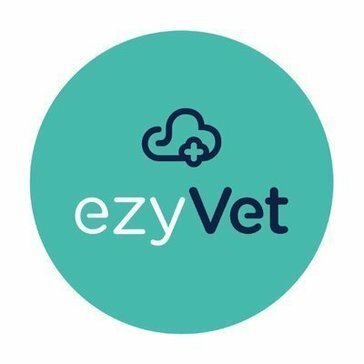 ezyVet is not a perfect fit for a larger 24hr hospital setting but it is updated frequently and changes to the software are able to be requested/voted on. No help or feedback for this issue after 3 months - can only ever speak to call centre and never an actual tech - if these techs really are working on this issue, then 2 minutes on the phone is not a lot to ask. Please talk to me. "Once properly trained on Ezyvet, this program meets the needs of a busy multi-doctor vet practice." This product is cloud based, making it accessible from any computer or device with internet, WiFi, or data plan capabilities. We have had instances where we have lost internet, but I was able to access and use the program with ease via my iphone. I enjoy Ezyvet's text message communication capability. Any text communication is automatically entered in a client's communication log. Email is the same way. Ezyvet sends someone to train and assist your staff the first week that you implement Ezyvet. This was VERY helpful and vital to our success with Ezyvet. Also, Ezyvet's technical support is prompt in addressing any issue that you may have, even if there is not an immediate fix to the problem. Although this software seems very complicated upon first glance, once trained, this software is relatively easy to use, and it meets the needs of a busy practice. First of all, price. Ezyvet is expensive. Be prepared to spend some money for this program. Also, the company is based out of New Zealand, so the time difference was a little inconvenient during the training process. Another thing to note is that this is a newer software, meaning that there are some features that do need improvement. Finally, there is no payment system integrated with the software, meaning you must find a separate merchant service. This leaves room for error when entering payment amounts from Ezyvet into your credit card software. Ezyvet looks intimidating at first, but once trained, it becomes much easier to use. It has a lot of great qualities including integrated email and text messaging, integration with SmartFlow, and an inter office memo system. Remember though, Ezyvet is still new, so be prepared to encounter some issues that may not have a solution yet. Ezyvet meets the software needs of a busy vet practice. Its integrated text messaging and email capabilities are improving client communications. Its integration with Smart Flow is improving the tracking of hospitalized patients. recorded tracking is very easy you can look up a client with their name or number or email. I highly recommend other clinics to use this product. # love their customer support. tracking products and revenue helps the company know how much we are growing. "Could use many updates, a bit messy"
I enjoy having tabs which lead you directly to a specific section of a clinical record. I dislike the layout of the website in general. I think there is too much information spread out that could easily be condensed or refined to a simpler process. Some payment processes are ridiculous in terms of how many places you have to check to ensure that it was processed correctly after an incorrect payment. It is not as efficient as it has the potential to be. Gets the job done, but many times you have to spend hours trying to fix a problem or find the exact tab you need to input information on. It allows for easy storage of bulky information, quick messaging between coworkers and to clients. I love how easy it is to look up patients and their owners and that everything is color coordinated. I like that I can access it from my phone. There are a lot of steps and different tabs that I get confused where everything is at or where to go to put in things. It has been very helpful to look up the patients on your phone when your our in the field instead of having to get on a laptop. "Helpful, knowledgeable support and fairly user friendly"
I loved that this software was fully integrated to smartflow, so that anesthetic sheets, pictures, etc. we’re automatically generated to the MR. I was fairly user friendly, but what made it incredible was the IT support. I have used other programs that are more user friendly. I particularly didn’t like that you had to choose the correct color to get the whole MR. There is a long learning curve, as there are so many features to this software. Automatic billing for treatments has been the best part of the software. "EzyVet is very functional, reliable and user friendly." I like how simple the process is on sending out reminder cards and pet records to our clients. At this time I have not encountered a problem with EzyVet, all problems have been resolved. The ease of navigating the program. It's internet based and can be accessed on any computer. Cloud based program and is constantly updating. Easy access, keeps patient files organized, allows for keeping notes digitally and scheduling appointments and reminders. Easy to look up customers information and pets information. Uploads way to slow. The date always needs to be changed in all boxes, would be nice if date generatered om its on. Combining all the clients and pets information in one file. "Daily user for ER vet hospital, owned by Pathway Vet Alliance "
"Ease of navigation and use"
Easy to navigate. Easy to access. Functions with additional software. Frequently malfunctions from the providers end. Easy to track invoices and payments. Great storage of information. The clinical summaries are impossible to read and make no sense. We use it to make a lot of email templates, and that helps save time. Used this the past few months and I had no complaints! Don’t really have any complaints, did what it’s supposed to do. * We monitor all ezyVet reviews to prevent fraudulent reviews and keep review quality high. We do not post reviews by company employees or direct competitors. Validated reviews require the user to submit a screenshot of the product containing their user ID, in order to verify a user is an actual user of the product. Hi there! Are you looking to implement a solution like ezyVet?